Playmaker Help / Re: How to return the scene point from a Render Texture and store it to Vector 3? Thanks. Now I'm going to try it! Playmaker Help / How to return the scene point from a Render Texture and store it to Vector 3? I write because I used a render texture to show what the Topdown camera is seeing. Now I need to select a gameobject placed in the scene within this render texture. So the raycast which hit a point of the rendere texture, should be emited by the top down camera and return the obj I clicked on. How Can I make it possible? I tried with Custom Mouse Pick from Ecosystem, but it didn't work. i just very recently made a video for bullet holes, maybe it can help you. But i will redo the video as i forgot to show how to build the prefab or use an offset. 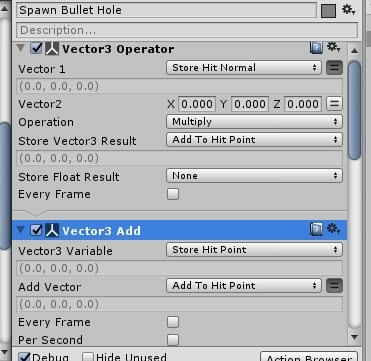 if you need the offset you can add these 2 actions to the 'Spawn Bullet Hole state to have it a bit in front of the wall. It works 50\50: Sometimes it make mistakes with rotation, so the decal is placed in the wrong angle. I'm not using pools, I don't need it. I have already a decal system. Cool man! I'm trying now! :). I'll let you know. The offset is provided by EasyDecal, so I don't think to have problems. Hi, I recently bought a decal system. I made a FSM which should place these decals based on the point and the normal angle. Raycast hit point works, but the decal doesn't set the right rotation compared to the hitten wall. So the decal spawn correctly only on the floor. Do you need some screen too? Ok, thanks so much... fortunately this time it was nothing of impossible to resolve. Unfortunately I had to re-create all variables. Now it works, next time I will make a backup. Hi, I should appreciate rapid help, because this half-week I must send my game to the greater videogame festival in Italy. When I created the project a month ago, some variable deleted causeless but I always ignored just by re-creating them again.This evening after a bluescreen caused by the Unexpected Kernel mode Trap error, Playmaker lost all global variables! Have you got a two-screen setup? If so disconnect the 2nd screen and the action browser will pop back into your main window. That's a good suggestion, but no luck. They recommend cascading windows, but unfortunately Action Browser is not among the windows that appear in the taskbar - whether on or off the screen. Mmh... I never had a problem like this, sorry. I should try as last chance to installing another version, so maybe the windows position will reset itself. Did you already try to search on Google if there's a generic metod to reset the windows' position? Maybe you accidentally moved the Action Browser out of the screen? Do you use Mac or Windows? Did you try to check behind the Start bar? Hi, I trought if it is possible, using LookAt, check the look at angle and project a different sprite. Did you play Ultimate Doom and Doom II? The character sprite "fake rotation"should change based on where the player is and where actually the enemy is looking at. VR Help / VRTK - Missing scripts? Hi, I write again because Unity gives me an error. Unity says in debug console:"
Assets/VRTK_Playmaker3x-master/TriggerEvents/Haptics/HapticAdvancedRumble.cs(32,8): error CS0234: The type or namespace name `VRTK_ControllerActions' does not exist in the namespace `VRTK'. Are you missing an assembly reference? I reimported all, but the error persist.